This episode is a bit of a departure from my normal format. The original idea for having a part 2 with poet Dean Rader was simply to have continuation of the discussion we began back in episode 47. If you haven’t listened to that, I definitely recommend jumping back and catching up on his work. Dean and I share an interest in engaging with socio-political themes in our creative work. In our previous conversation, we ended with the idea that we’d have a discussion about how we both make pieces with socio-political content. We are also curious about interdisciplinary work and how one practice brushes up against another. In that spirit, I sent Dean a number of links to some pieces of mine. As it turns out, he had a lot of questions and... I had some long answers. The conversation we then had ended up being mostly about my work. I so rarely talk about my own work on the podcast, so it was great to have the opportunity. I want to say a special thanks, again, to Dean for his interest in my work and the terrific conversation! Dean Rader has published widely in the fields of poetry, American Indian Studies, and visual culture. His poetry has garnered a number of awards and recognitions including the T.S. Eliot Poetry Prize. His newest collection of poetry, Self-Portrait as Wikipedia Entry, was recently published by Copper Canyon Press. A native of Western Oklahoma, he is now based in San Francisco where he is professor of English at the University of San Francisco. Sparrow Song which was featured in the terrific book edited by Theresa Sauer, Notations 21. The Innocents - a collaborative performance piece with Allen Otte based on social justice issues of wrongful imprisonment and exoneration through DNA evidence. 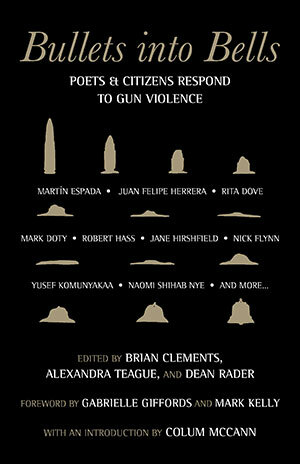 Make sure and check out the new book that Dean co-edited: Bullets into Bells.